Lucas Luhr (27) and Mike Rockenfeller (23) will strengthen the Audi driver squad in both the DTM and in sportscar events with the revolutionary Audi R10 TDI Diesel sportscar during the forthcoming 2007 motorsport season. Both Germans are products of the Porsche "Star of Tomorrow� scheme. Lucas Luhr made his breakthrough in 1999 after winning the Porsche Carrera Cup. In the following seven years, the youngster from Koblenz developed into one of the world�s best sportscar drivers. Mike Rockenfeller is of one Germany�s greatest future talents. 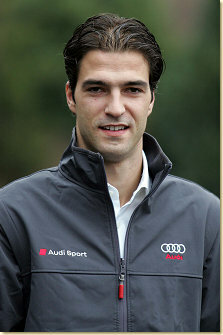 In spite of his young age, the new Audi factory driver from Neuwied can already look back on an impressive career. He also won the 2004 Porsche Carrera Cup � at the age of 20, the youngest driver ever. Numerous victories followed in sportscar races around the world.